In-vehicle wireless connectivity is expanding rapidly from luxury models to high-volume, mid-market ones. It’s predicted one in five vehicles will have some kind of wireless network connection by 2020 which will account for more than a quarter of a billion cars on the roads, globally. For fleets, connected car technology has the potential allow us to understand almost every aspect of a vehicle’s operation in real time, including speed, acceleration and deceleration, mapping, engine performance and fuel usage, among many other factors. Combining this intelligence to services available to the driver, along with predictive analytics, will completely transform the fleet management industry. For example, in identifying peaks and dips in the fuel efficiency of each vehicle, driver behaviour that might be uneconomical could be addressed, ultimately improving efficiency. Measurements from hydraulics and data from sensors could also help identify maintenance issues and mechanical problems before they even occur, ultimately reducing vehicle downtime and increasing the productivity and reliability of a fleet. The technology also has the potential to determine whether the driver is distracted or tired, what their heart rate is and ultimately whether they are in a healthy state to drive. All of which could vastly reduce driver-related incidents and insurance premiums. 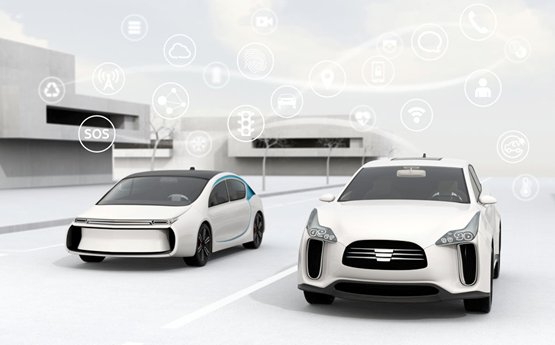 For some, connected car innovation may still seem like it’s in its infancy but, as we see the worlds of technology and automotive intertwine, fuelled by legislative initiatives, the future may be closer than you think. The connected car and the generation of so-called ‘big data’ is set to change the long-established fleet management model, particularly in respect of vehicle service, maintenance and repair (SMR), and driver behaviour. However, as cars become ever-more intelligent and the ‘computers on wheels’ have the capability to deliver vast amounts of data there are huge concerns that impact dramatically on fleet managers and company car drivers. As a result, ACFO is urging fleet operators to ensure that when they are in discussions with their manufacturer partners and vehicle leasing suppliers that the issue of ‘big data’ and everything that it entails is on the agenda at review time. It is vital motor manufacturers and the contract hire and leasing sector engage with ACFO as, ultimately, the association’s members are their customers. As a result, ACFO has already asked members to provide their views and concerns. Today’s connectivity is the start of the journey towards the autonomous car and there are risks to be overcome, but opportunities that will, ACFO believes, deliver fleet operating benefits. The extensive vehicle-related data that telematics technology can deliver continues to open opportunities for aftermarket connected car services. TomTom Telematics, for example, is now offering connected car services to car dealerships, consumers, the vehicle leasing, rental and UBI (usage-based insurance) markets, importers and manufacturers. Developments in the connected car, as a consequence, are not only promising to make life easier for individual motorists but, in the world of business, they have the potential to help fleet organisations become more efficient through smarter use of data. Apps are available, for example, that can help businesses create more accurate HM Revenue & Customs (HMRC) mileage claims by automatically logging trips and allowing drivers to validate them from their smartphone or driver terminal. Fleet management data can also be combined with customer data to help sales teams work more efficiently. This enables sales managers to compare trip data with opportunities, leads and closed deals so the effectiveness of sales representatives can be analysed. Such integrations can reduce reliance on paper-based systems, helping companies to cut the administrative burden through seamless data flow between field, vehicle and office. With aftermarket systems offering the possibility for most vehicles to become connected straight away, connected car innovations built on the telematics platform look set to continue transforming the world of business and motoring. Connected vehicles will have a revolutionary impact on the rental and leasing industry. They bring many advantages, from reduced emissions and improved road safety, to cost reductions and more efficient processes. But connectivity also facilitates the collection of enormous volumes of data about driver behaviour, user preferences and the vehicles themselves. For BVRLA members to deliver the fleet management and mobility services of the future, they need access to this data. The data itself needs to be provided in a standardised format that is safe, secure and provides fair competition. When rental and leasing companies have access to data of this type, they will be able to ensure fleet operators can benefit – by continuing to have freedom in choosing where their vehicle gets repaired, for example. The BVRLA is already working with its members and their customers to explore potential use cases for connected vehicle data and how access to this data should be provided. This is vital, be it for service, maintenance and repair budgeting, employers’ duty of care obligations or simple mileage management. Furthermore, it is imperative that motor manufacturers start addressing the specific data access requirements of a very significant group of vehicle owners and purchasers – leasing and rental companies. In essence, connected car technology could offer fleets access to real-time data covering almost every major parameter of vehicle use. If that data is harnessed for fleet management purposes, it could be used to support improvements in safety, service and maintenance costs, compliance and much more. Some estimates indicate that one connected car will upload 25GB every hour (to put that into perspective, the average person uses about a tenth of that on their mobile phone every month). The question is, how do you work through and interpret such a massive amount of data? The answer is fleet management software. Fleet management software has already been dealing with rapidly increasing levels of data for probably three decades. What our software does, essentially, is enable the fleet decision-maker to report on and make sense of their disparate fleet-related information. Connected car data is just another step in that journey, albeit an exponential one. There are a few other important points to consider on this subject. One is that question marks remain over connected car data ownership. Manufacturers, for example, will probably want access to as much vehicle data as possible in order to learn about how their products are used. This certainly makes sense. However, there are also strong reasons for fleets to keep close control over data and choose who can access it and how it is used – such as concerns over privacy and information security. We believe that it’s important to establish workable solutions to the question of data ownership early on. The connected car represents a new era for our industry. It has the potential to revolutionise car rental for consumers and businesses alike, opening the door to a more seamless, intuitive car rental experience, and giving businesses valuable insights into consumer preferences, safety and security, and fuel efficiency. From the app on your smartphone you will be able to see which car you have been assigned and have the option to change to other vehicles in the same price bracket or to upgrade at the touch of a screen. You will then walk to the car and open it with your smartphone. You will find the keys already in the car and you can simply drive away. No paperwork, no signing in multiple places and no waiting. When you return the car it will automatically tell us the final mileage and the fuel reading as it arrives on site, and you can close out the rental agreement from your phone.